Fight back by educating yourself on what NEVER to buy with these pages of photos and tips! Remember, you vote with your money...any buying of fake junk only supports and encourages them to make more. Wouldn't you rather have awesome official items? Wouldn't you rather enjoy cool good quality stuff you know you can depend on? If you want the real deal, bootlegs are never the way to go. Here is a fake light switch plate. Anything that can be ironed-onto can be faked. In this case it's a "Baby Onesie" which is basically a sack with sleeves and holes in it into which you're supposed to insert a baby. 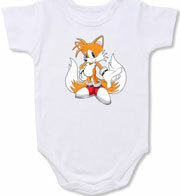 The Tails graphic isn't even ON the shirt! It's just a photoshop of what they'll iron on later. You have to wash baby items frequently, which spells trouble right away for flimsy shabby iron-ons! How long would this one last? There's no telling but the bootlegger won't care if it washes right off baby's new clothes--and leaves you with a mess you over-spent for! If an auction shows JUST the shirt graphic, never bid. Do you want a real shirt? Demand photos of a real shirt. 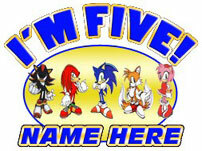 The image can be of anything, like the above stock arts, Sega logo...whatever. If they had a real shirt they'd show one. It's a sure-fire sign of a fake if they can't even show you real merchandise before you buy--so don't do it. they put FAKE copyright info right on one of the holes so you can never read it. A real company won't knock out their own information! This figural clock is rather odd. It's an Item Under Suspicion. It has not been proven to be a fake, but MOST LIKELY is. It is fairly Sonic-like but it has so many errors that really it shouldn't be official. The eyes are separate, no visible spikes, his face is pinkish, the arms are white, he has super small hands, the shine-dot is in the center of the ey, there is no mouth and it does not say 'Sega' anywhere on it. The clock says 'quartz'. Apparently the button on top helps to set it. It's also billed as being able to sing, which is odd. What noise could it make? This clock should be proved one way or the other, but most bets say it's a phony sometimes sold on ebay. Photo discovered by ShadowWorld. When is a bootleg not ALL a fake? When it's SonicEraser! With an odd name, strange premise and amature-ish looking cover, it looks like this would be all bogus. It is interesting though, because it is not. The cartridge is for MegaDrive (EU) and comes in a standard box with screenshots, good description and instruction manual. This is way more than most bootlegs will do. However, it's made possible because the GAME itself is not a fake. 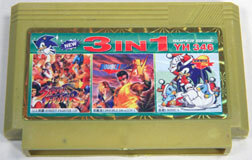 It was produced for the Meganet an internet add on for the Megadrive only in Japan. It may have had a cartridge in Japan. 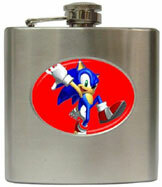 It appeared around the time of Sonic 1. Not heard of it? That's because it failed. The internet was too new and the console too old to make it a good match. 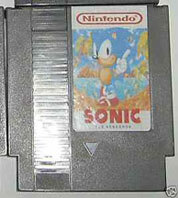 What someone's done is...they took the game and somehow burned it to a cartridge, then made up a box with it's info. 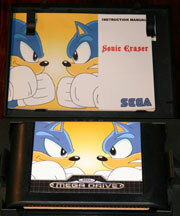 So what IS Sonic Eraser? 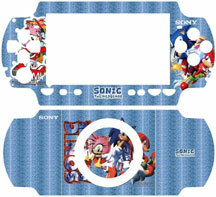 The back states the premise as Sonic is fighting a fake Sonic...somehow. That's their excuse for 2 Sonic sprites spinning into eachother when you make a move in the puzzle. The game itself is like Dr Mario/Mean Bean Machine, but you're matching jewels instead. When you get a combo it breifly disables the other player. It has 10 difficulty levels but the music is pretty poorly done. The red rectangle in the top shot is a story book that opens up and explains how to play. What you see in the video is fan translated, the real thing would be in Japanese because Meganet never made it out of Japan outside of a brief period on SegaChannel which was the other online service for the USA but it didn't work either. 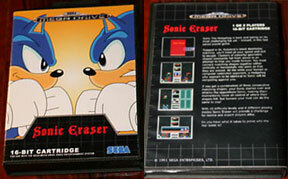 You can see a Sonic Eraser Video on youtube with that link to really get a feel for it. Photos discovered by Berzeker. This bootleg is a very strange one. Due to it being a beverage related container buying fake ones is especially hazardous due to things like improper/toxic coatings on the metal, fake stainless steel rusting, and other nasty health hazards. FAKES are NEVER regulated! Photo discovered by Berzerker. Look out, it's the super hero of closet-hangers! Turban Hog! 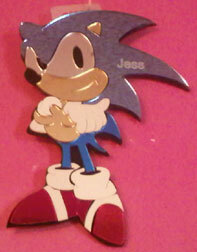 Someone has clearly tried to steal Sonic to make up their shabby hanger-shilling mascot. Inside this box are clothes hangers for your closet bars. 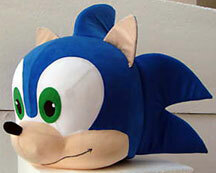 The company (trying to capitalize on Sonic's coolness) has 'modified' a stock Sonic into some wierd mascot type thing. They put a "P" on him like a super hero, used different shoes, erased his spikes and replaced them with...some kind of turban type thing! It's a good thing they didn't take a very good art, as the mutant mouth and bonkey-eyes help keep this rather random package from looking too Sonic-ish. This Photo discovered by TotallyLooksLike . This thing is so bad it's funny. 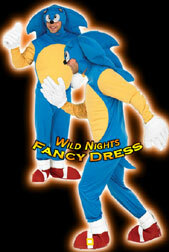 This is an adult Sonic costume that's clearly bogus. And hilarious, but what's funnier? The crossed eyes, or the fact that it's called a "Fancy Dress" and talks about "Wild Nights"? The unfortunate person modeling it also is afflicted with a case of the 5 oclock shadow, which certainly does not help with the lower part of the face. Is your head shaped like a bean? Do you look EXACTLY like Homer Simpson? When bootlegs appear, shabbyness abounds! 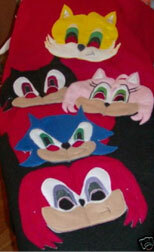 This is clearly a set of fake Sonic masks. Is this figure real or fake? THAT is the big question as stores online claim to be selling it. But NO ONE sells loose figures (out of box) unless they're vintage, or bootlegs. 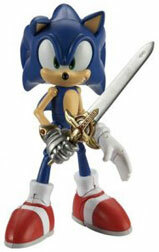 Jazwares would never release a no-box figure. So why do all stores (Amazon, KiddiMax) only have just this one photo and no box? Why do they all claim he's a 5inch, when clearly all Super Posers are not? The other thing to note is his smaller guantlet-hand and the little Caliburn. It LOOKS like they're off of the 5 inch Figure and do not belong on the Super Poser. A few people have found him elsewhere, but its always the same photo. 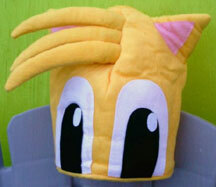 It really resembles the fan item on Fan Items 8, where someone DID modify a SP into SBK Sonic. That fan artist has process shots of cutting up the hand and putting it back together in the gauntlet, so they didn't "steal" this mystery figure. But, as you can see with that tiny hand, this one looks to be more of a kitbash. 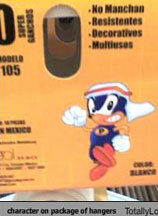 Is it a case of stolen art that was then mistaken for an official toy?